The trapezius muscle is a large muscle bundle that extends from the back of your head and neck to your shoulder. It is composed of three parts: the upper trapezius, middle trapezius, and the lower trapezius. The trapezius, commonly referred to as the traps, are responsible for pulling your shoulders up, as in shrugging, and pulling your shoulders back during scapular retraction. The trapezius muscle is divided into 3 areas: The upper fibers, the middle fibers, called the middle trapezius, and the lower fibers, which are called, you guessed it, the lower traps. The division into the separate, distinct parts of this muscle is about functionality. In other words, each area does something different. The upper trapezius arises from your occipital bone in the back of your skull and the nuchal line in the back of your neck. The muscle also has attachments to the spinous processes of cervical level one through six via the ligamentum nuchae. Attachments of the lower fibers of the trapezius arise from the spinous processes of cervical seven through thoracic level 12. The muscular fibers of the triangular shaped traps travel to insert on the spine of the scapula and the acromion of the scapula. They also attach to the outer one-third of the clavicle, or collar bone. Nerve innervation to the trapezius muscle is interesting, as it is served by a cranial nerve. This nerve, called the spinal accessory nerve, or cranial nerve XI, arises from your brain stem and travels from your skull down to the trapezius muscle, providing motor input. The trapezius muscle acts as both a posture stabilizer and a movement muscle. Common actions you may recognize in which the trapezius is involved include shrugging your shoulders, tilting, turning and extending your neck and keeping your shoulder blades down your back. The upper trapezius, the part that goes across the tops of your shoulders, can elevate, or bring up your shoulder girdle. It also helps extend, tilt and rotate your neck, which has the effect of bringing your head back, to the side and turning it, respectively. The rotation function takes the head into the opposite side to which this neck and shoulder muscle is located. While elevation of the shoulders the official action of the upper trapezius muscle, this is not always a good thing. If you work at a desk, or your job involves a lot of driving, you likely know this experience first hand. When the shoulder girdle is pulled up in a constant and chronic way, it leads to misalignment that can make the upper traps chronically tight. The result may well be a pain, limited movement and a loss of neck flexibility in that area. 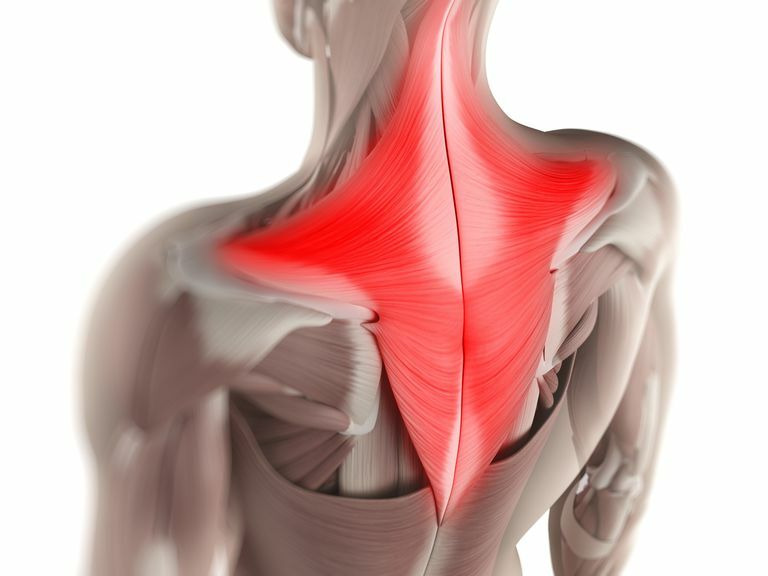 Together with the lower traps, the upper trapezius also helps rotate your shoulder blade upward. This movement occurs when you lift your arm up to the side, provided your shoulders, neck, and upper back are in good alignment and your muscles are flexible. The middle trapezius helps bring the shoulder blades back, toward the spine. Again, if you sit at a desk or drive all day this may prove a handy move for preventing or managing excessive kyphotic posture in that area. The middle trapezius also helps stabilize the shoulder during certain arm movements. And finally, the lower trapezius muscle is tasked with the upper and mid-spine stabilizing action of bringing the shoulder girdle down. This is the opposite action to that of the upper trapezius discussed at the beginning of this article. The trapezius is an accessory breathing muscle. This means that it helps open up the small amount of breathing room in the upper chest area. But instead of relying on this muscle for breath support, consider developing the capacity of your most primary and powerful breathing muscle, the diaphragm. Problems with the trapezius are rare, but may occur. Any injury to the spinal accessory nerve (cranial nerve XI) can cause weakness or paralysis of the trapezius muscle. This would cause you difficulty in shrugging your shoulder or lifting your arm up properly. Your shoulder may also sag down on one side. Muscle spasms and pain may also affect the traps. For all but the most vigilant of us, living and working in the 21st century can bring about a serious deficit in movement. While this has its conveniences, you should be aware of the drawbacks. For one, muscles that remain inactive for most of the day are much more likely to go into spasm and give you pain. The trapezius muscles may be just the muscles that do this. How well can I move my shoulders up, and especially, down? Do I have pain or uncomfortable sensations at the top of either shoulder or both? If your shoulder movement is limited and/or there's pain in the area, one or both of your upper trapezius muscles may be in spasm. Fortunately, solutions exist that for the most part are non-medical and easy to implement. Tight upper trapezius muscles often respond well to massage therapy. And because they are located such that you can reach your own, you might consider trying a self-massage technique. The upper trapezius muscle, along with other shoulder muscles such as the infraspinatus, tend to be fertile ground for the development of painful myofascial trigger points. A massage therapist skilled in the art of myofascial release may be able to help you here. Also, a 2018 study published in the Journal of Sports Rehabilitation suggests that dry needling, a form of acupuncture, may help alleviate the pain and related symptoms perpetuated by trigger points. Exercises for the trapezius can help them perform their job appropriately. Things like shoulder shrugs and scapular stabilization exercises may be done to keep your traps working properly. Checking in with your doctor or physical therapist before starting trapezius exercises is recommended. Kamali, F. Comparison of Upper Trapezius and Infraspinatus Myofascial Trigger Point Therapy by Dry Needling in Overhead Athletes With Unilateral Shoulder Impingement Syndrome. J Sport Rehabil. Jan 2018. Kendall, Florence, McCreary, Elizabeth Kendall, Provance, Patricia Geise. Muscles Testing and Function 4th ed. Williams and Wilkins. Baltimore, Maryland, 1993.